You must make reservations at least 5 minutes in advance of the time at Angelo's Pizzeria & Bistro. Please call us at the restaurant (910) 754-2334 so that we can better assist your catering needs. 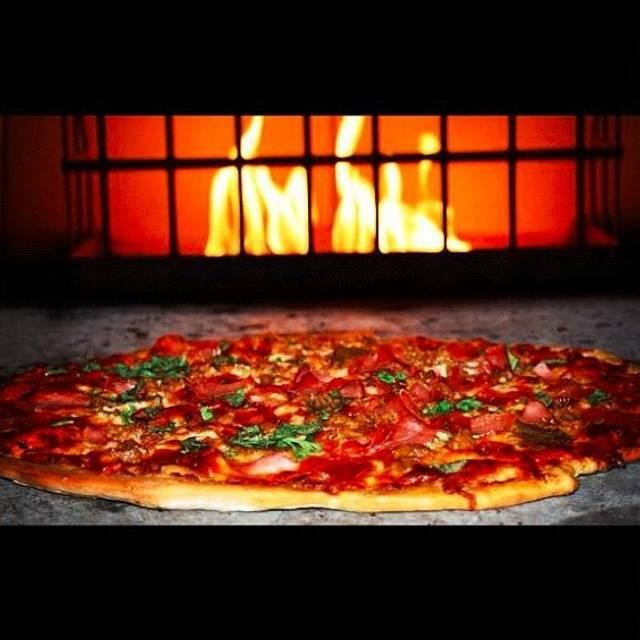 Angelo's Pizza and Bistro is famous for its brick oven flavored pizzas, house made pastas,award wining wine list and personal service. Our restaurant serves more than just pizza and smiles. We have diverse lunch and dinner menus that includes homemade soups, salads, Italian dinners, fresh seafood,USDA steaks,house made pasta,calzones,strombolis, tantalizing sandwiches and great appetizers! Angelo's has received an award of excellence from Wine Spectator for our wine list,we have a vast selection of vintage, boutique and reserve wines which is always available from our wine supply. We're a great place for lunch during your work day. Carry-out? No problem. Call us ahead and we'll have your carry-out order ready when you arrive. Fresh romaine hearts mixed with croutons and Parmesan cheese tossed in a creamy Caesar dressing. The salad can be made into a small or large portion. Iceberg lettuce topped with chopped onions, tomatoes, blue cheese crumbles and bacon. The salad can be made into a small or large portion. Fresh strawberries, romaine lettuce, goat cheese and candied walnuts. The salad can be made into a small or large portion. Breaded and fried eggplant topped with mozzarella cheese and marinara sauce. Spaghetti topped with our house made tomato sauce. Toppings: Extra cheese, Bacon, Banana peppers,black olives, ham, jalapenos, mushrooms, onions,pepperoni, pineapple, meatballs, roasted red peppers, goat cheese, sausage and spinach. We have several dinner specials daily, we also have options for dietary needs. please call us to find out more details. This is one of our favorite places to have dinner with friends. The food is always good and on Wednesday’s the wine is half price. Being a New Yawker and growing up near the Arthur Ave Italian Restaurants, I have become spoiled with the authentic Italian cooking. Out of all the restaurants we visited, Angelos comes the closest. However, the veal chop parmigiana knocked these Irish socks off. Fantastic!!!!!!! Although Angelos is situated in a strip mall, the inside has great ambience. Our waiter was friendly and professional and gave the right amount of attention. The food was excellent. I had a shrimp and pasta dish, my husband the pasta with clam sauce and they were both wonderful. The restaurant also has a great wine selection and hosts wine tastings. I found Angelos a little pricey but certainly great if you want a nice evening. Great place to bring family and friends. We made a reservation and that was a good idea. Large crowd on Saturday night! The service was spot on and the food was delicious. Delicious food. Outstanding service. A favorite with us. Excellent service and food choice. Never been disappointed! The waitress recommendations were great, the food was delicious, and we even splurged on dessert. I have eaten here before, so was confidant to invite friends to join us. All 4 of us were more than pleased! Best Italian food in the area. I highly recommend this great restaurant. We are regulars, because, of your wonderful employees and food! Excellent service and the meatball appetizer was delicious! We had a great dinner. All four of us in the party enjoyed our meal. Service was great. The only negative was that it was a cool night and we were somewhat close to the door and every time someone came in, a blast of cold air came in also!! It was a busy night and all the other tables were taken. Luckily, there aren't that many cold nights in North Carolina!! Great food. Very consistent. Good service. We have dined at Angelos several times. They have great pizza. We Recommended it to friends. This is the 1st time we (all 4 of Us) ordered VealParmagna, very disappointing. It was served on a white plate. The veal slice was dry, very little sauce & cheese & the small serving of pasta was cold, again, very little sauce. Thought it was pricey at $24. We are from the NJ/NY area where a veal dish is served in the hot platter it was cooked in with a good amount of sauce & cheese. Enjoyed our meal with out of town guests. Everything was good and we had a nice time. Angelo's is always amazing. It is our go to Italian restaurant. Angelos has always treated my wife and I like family. The food and service is always fantastic. Good food, good service and with reservation, no wait! When we are in town we always enjoy the excellent food at Angelo's. Their wine prices are a bit high but their food is delicious! We have never had a bad meal at Angelo's. Our go to spot for great Italian food with excellent service and a reasonable price. Everything we have ever tried there is excellent. This time I tried the lasagne - so good! My husband and I had never been to Angelo's but had been to an event where they catered, so we wanted to try it. We asked another couple from out of state to join us. Wonderful meal --chicken piccata, veal parmegiano, ossu buco and short ribs -- all fabulous. We also shared a wonderful bottle of wine. We will definitely go back and will recommend it! Delightful dinner with friends! Angelo’s wait staff is outstanding and provides wonderful service. The Chicken and Shrimp Rustica got rave reviews from our friends. 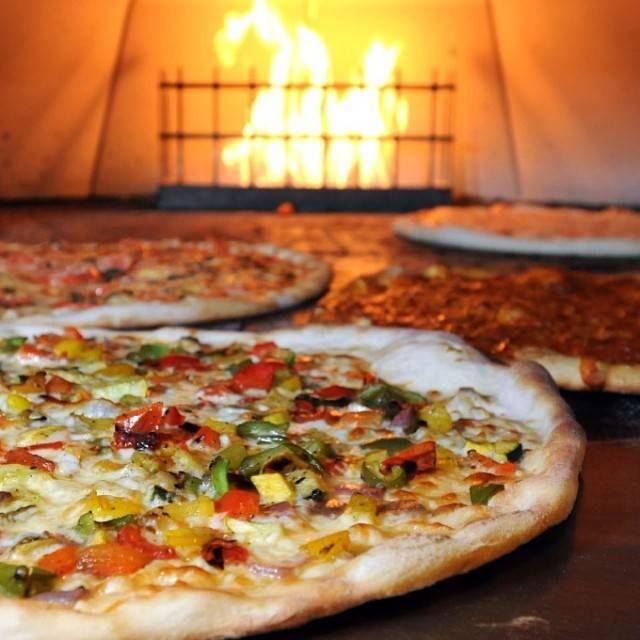 Another couple declared the Vegetarian Pizza to be one of the best they had ever eaten. Our Tortellini Michaelango was fresh with an excellent Alfredo sauce that was perfect in creaminess and richness. Angelo’s is one of our favorite restaurants! Great to find Zucchini pasta as an option with all of the fabulous entrees. For people restricted to a Gluten Free diet, it was like a dream come true! Consistently good food. Love the zoodles (zucchini noodles). Summer is the best server. She remembers our wine preferences every time we come in. We tried Angelo’s for the first time and decided on pizza. It was very good. It was exactly how it was ordered and came to the table piping hot. It tasted delicious. The server was fantastic. Very attentive. The restaurant was very busy and the noise level was high, but it was a good experience. We will return! The food was good and service equitable. Tables are too close so you are part of the other guest’s conversation whether you want to be or not. The wine selection by the glass is not too ambitious and I think they could improve on that aspect. Pizza was baked just right with a delicious crust and fresh ingredients. The Calamari were like butter and the caprese salad was delicious too. Plus they served salmon with zucchini noodles which I have never yet seen in any restaurant and they were perfect! Definitely recommend for a delicious casual meal. This place is a little gem! We always enjoy eating at Angelos. The wine sommelier suggested a very good Italian wine to compliment our dinner. We shall return to Angelos to dine in the future.